What Jean-Luc meant by this is explained by a diagram he had in his slideshow. In it, he dichotomizes (perhaps too starkly) facilitating vs. lecturing, where lecturing is supposed to be the mode of transmission used when the content is most important – “I have to get through all this content!” The other side of the diagram is “facilitation,” or how you create an atmosphere and construct a course to facilitate student learning – “I have to get these students to learn!” A new instructor might not see the difference between those states – isn’t getting through all the content going to cause the students to learn it?? The answer is, well, probably not. Not if you don’t think about the mode of transmission, and it’s very easy in your first class to focus almost exclusively on the material, rather than considering its reception (and absorption). 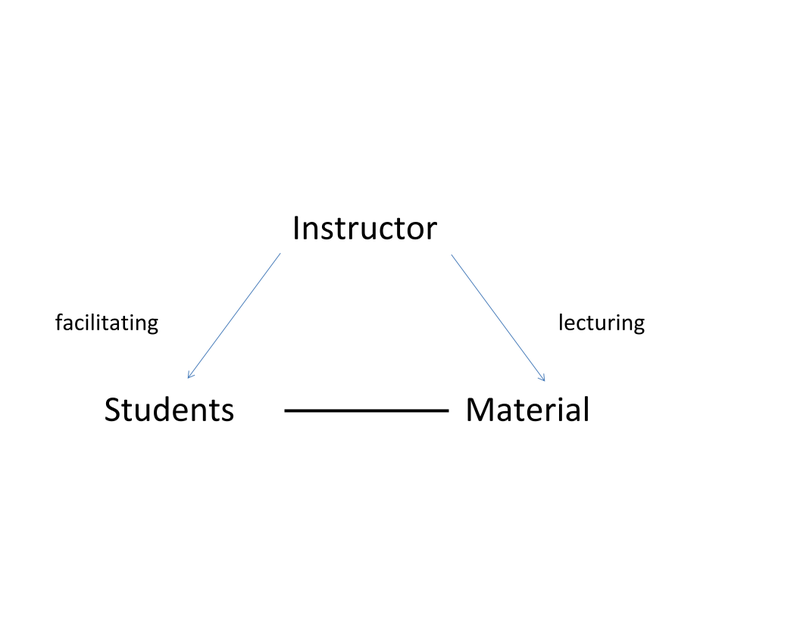 Lecturing has its place as a pedagogical tool, but Jean-Luc’s point was that it should be one of the many tools in your arsenal, not the default. Jean-Luc’s question is important, and sometimes overlooked. Yes, your students should show a mastery of something by the end of your class, but you need to know what that will look like and how it assess it. How do you know the understanding has taken place? Another common learning objective is “By the end of this course, students will learn to read texts critically.” Again, I would challenge new instructors to be more specific: what does it mean to read a text critically in your field? What will this critical reading look like, and how do you know it’s there? We all say we are teaching “critical thinking,” but unless we can say what that will look like, it is still hard to align assignments to make that key learning occur. I was floored – I had not considered how to articulate what I meant. I was taking for granted that we all knew what it meant to analyze the class, but why would you know that, unless you’ve taught a million (or a few) times? So I told her about the questionnaires about classroom format that I give my students partway through the course, and about using minute-papers to assess comprehension. But I added these techniques to my toolkit over time, especially the questionnaires, which I developed and refined over the course of a few quarters. The audience member’s question was a learning moment for me, a reminder of how important specificity is. What means something to me may mean something else entirely to you, and if I’m trying to teach you something, that disjuncture can scuttle the whole project. It’s humbling and gratifying to know that I will always learn about teaching, even as I teach about it.